This is one of our favorite meals. SO GOOD! (and yes, you're right.....this is not a picture i took. my camera is not functioning correctly right now, so i have to go online and find pictures that look similar to what i make. is that cheating?). I know, cheap. Preheat oven to 425 degrees. Heat oil in a large saucepan over medium heat. Add onion, garlic and season with salt and pepper; cook, stirring occasionally, until softened, about 5 minutes. Add thyme and tomatoes. Bring to a boil, reduce heat, and simmer, breaking up tomatoes with a spoon, until sauce is thickened and reduced, 20-25 minutes. Meanwhile, cook ravioli in a large pot of boiling water, just until they float to the top (pasta will continue to cook in the oven). Drain pasta; return to pot. Toss sauce with pasta. 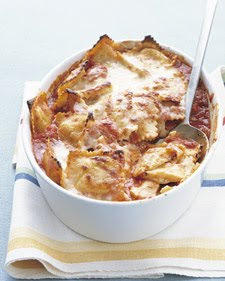 Pour pasta in to a 9x13 baking dish, and sprinkle with cheeses. Bake until golden, 20-25 minutes. Cool slightly before serving.